Voted the number 1 hotel in the UK by TripAdvisor, and with a prestigious Forbes Five Star Rating, 41 is an exquisite hidden gem, and arguably the closest 5* hotel to Buckingham Palace, a short stroll from Victoria station and the city’s top attractions are within easy reach. 41 is one of the most distinguished and admired hotels in London, a discreet and intimate hideaway and it has the relaxed feel of an exclusive private members club. A chic black and white design runs throughout with mahogany furniture, original artwork, and live fire places in the rooms, comfort is at the forefront of our minds. The exceptional service and amenities include the famous Executive Lounge where guests are invited to ‘plunder the pantry’ and enjoy a glass of Champagne by the fireplace. 41 is a true ‘home away from home’ where a professional team seeks to surprise and delight at every turn; begin your stay with a welcome glass of champagne on arrival and feel thoroughly spoilt with all day ice cream, freshly bakes scones with jam and clotted cream served as high tea, and a selection of evening canapés and appetisers, all which are complimentary. 41, directly overlooks the Royal Mews of Buckingham Palace – the only way you are going to spend the night any closer to Her Majesty is to come on a state visit! The Queen, of course, is at the very heart of her capital, so 41 is perfectly situated for visiting all of London’s major attractions. The Queen’s Gallery, displaying many of the best works of art from the Royal Family’s personal collection, is a two minute walk. Keep going another few yards and you are standing directly in front of the Palace itself. From here you can watch the magnificent spectacle of Changing the Guard. In the summer months you can also take a tour of the Palace’s breath-taking State Rooms. From the Palace wander down the tree lined Mall, with lovely St James’s Park on your right and St James’s Palace on your left, and you soon pass through the magnificent Admiralty Arch and into Trafalgar Square. Turning right takes you down Whitehall, past the Royal Banqueting Hall, the Cenotaph, Downing Street and many of London’s most important government buildings. After only a few hundred yards the Houses of Parliament, Big Ben and the London Eye appear on your left, while directly ahead is Westminster Abbey, where Prince William and Kate Middleton were recently married. Turn right again to enjoy a pleasant stroll along Birdcage Walk. Following the edge of St James’s Park you are back at Buckingham Palace. If you have still got the legs for it, wander past the Palace, head across Green Park, and visit Apsley House, splendid home of the great Duke of Wellington. All that, within easy walking distance of the hotel! Lovers of art and culture are also conveniently placed – The National Gallery, The National Portrait Gallery, Tate Britain, the Victoria & Albert Museum, the Natural History Museum, the Science Museum, the Royal Academy of Arts, the Royal Albert Hall, the Royal Festival Hall and the National Theatre are all a short cab ride away. Shopaholics are also very much in their element. A short distance to the west you will find the glittering rows of fashionable boutiques along Brompton Road, Sloane Street and the Kings Road, with the legendary Harrods and Harvey Nicholls for good measure. Directly across Green Park and you are in Mayfair, exploring the wealth of upmarket stores on Bond Street, Regent Street, South Moulton Street, Piccadilly, Savile Row and the Burlington Arcade. There is no shortage of great things to enjoy in the evening. The two hugely popular musicals, ‘Wicked’ and ‘Billy Elliot’, are both being staged just around the corner from the hotel. The famous Mango Tree Restaurant, serving exquisite Thai food is also just a short walk away. Although no two rooms at 41 are alike, they do share a striking black and white theme. Within that simple device, their designers have come up with 30 unique rooms and suites, each with its own individual and stylish look. There is a hint of romantic mystery about those rooms. Thoughtful touches such as fresh fruit and flowers, delicious snacks and treats, scented candles, rich mahogany furniture and open fireplaces (not all rooms) ensure that your stay is luxurious and welcoming. Technology abounds – iPod docking stations, interactive TV with movies on demand, complimentary high-speed internet, radio, and CD player. 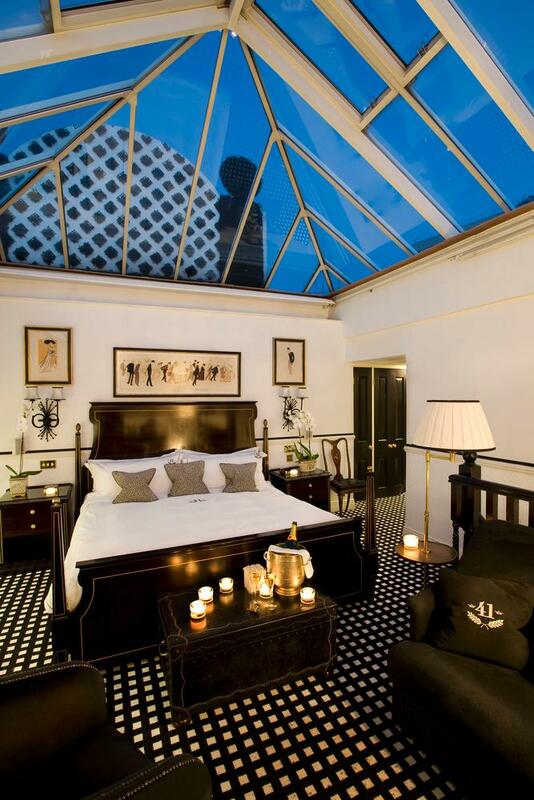 There is nowhere else in London quite like the Conservatory Master Suite. Where else could you sleep in such opulent luxury beneath the twinkling city stars? If you tire of the view, electric blinds turn your split-level suite into a private paradise complete with marbled bathroom and whirlpool bath. A combination of stunning views and penthouse seclusion make this an unforgettable romantic getaway. Spend a night in glorious black and white themed sophistication with beautiful mahogany furniture, marble bathrooms, luxurious toiletries, and plenty of 21st-century technology. Each Executive King Room is unique, but all reflect our love of quiet comfort and understated elegance. This is a room in which you can escape from a humdrum world for a day or two of uninterrupted bliss. A split-level Junior Suite gives you room to spread out. On the upper level, there is a luxuriously seductive bedroom; on the lower level, a spacious lounge for relaxing, eating, and entertaining. These eye-catching black and white suites are homely as well as thrilling. Each one features an open fireplace and plenty of soft furnishings for a mood of carefree glamour. Discover bbar, the chic and welcoming bar and restaurant, recently awarded a certificate of excellence from Trip Advisor for superior service, where you're warmly invited to enjoy our vast range of cocktails at the bar or tuck into delicious dishes in the restaurant. An elegant yet relaxed atmosphere with stylish South African inspired furnishings, bbar is the perfect place to catch up with friends, overlooking the Royal Mews and just a five minute walk from Victoria Station. Whether you are planning a private party, a leisurely lunch or dinner, evening drinks or a pre-theatre bite to eat, bbar is the place to eat, drink and be merry! We can cater to parties and celebrations big and small. Whether you want a set menu or something more unique, then don't hesitate to contact us, we'll be happy to help. We also have our unique and mouth watering take on Afternoon Tea - filled to the brim with delicious mini bunny chow with fillings including smoked salmon, cream cheese and chives, smoked chicken, avocado and pancetta and Boerewors, chakalaka and crispy onion. These will be complimented by freshly baked scones - both traditional and apricot and amarula; a variety of cakes and pastries and an extensive tea menu. Opulently designed with a rich royal theme of grandeur with polished silver, beautiful chandeliers and tailcoat waiters offering traditional service at its most welcoming. Experience the finest of dining with a glass wall which allows guests to catch some of the action taking place in the kitchen. Top quality cuts of meat will be grilled to perfection in the kitchen's brand new charcoal-fired Josper grill. Using the finest English produce and suppliers that serve the Queen's kitchen, the dining experience is accompanied by an extensive wine list including a fine selection from Bouchard Finlayson, our sister vineyard in South Africa. 41 is more like your own private club than a hotel - elegant yet relaxed and informal, delicious and satisfying. The menu includes a host of classic favourite dishes that make you feel very much at home – the kind of things your mother would make if she also happened to be an award winning chef! As you take a seat to check in we will roll over our Champagne trolley containing four different types of bubbly for you to choose from. And when you get to your room, a plate of fresh home-made delicacies will be waiting. When the time comes for you to leave we will send you off with water, apples and our Founder & President Mrs Tollman's famous rusks for your journey ahead. Car parking facilities are available nearby in the form of NCP pay parking. The price is £39.20 per 24 hours. Please note that central London operates a Congestion Charge zone between the hours of 7am-6pm Monday to Friday, excluding Public Holidays. The current daily charge when entering the zone is £10.00. For details on how to pay please visit the following website www.cclondon.com. Please be aware that as of 19th February 2012 the Congestion Charge zone has been extended West, to find out more please visit www.cclondon.com. There are several bus stops near the hotel, as well as Victoria Coach Station nearby. The Piccadilly line connects Heathrow Airport to Central London and the rest of the Tube system. The Tube is cheaper than the Heathrow Express or Heathrow Connect but it takes a lot longer and is less comfortable. Tube services leave Heathrow every few minutes from approximately 5.10 am (5.50 am Sundays) to 11.45 pm (11.30 pm Sundays).